Athletes, Your Locker Room Might Be Giving You Fungus | Podiatry Associates, P.C. 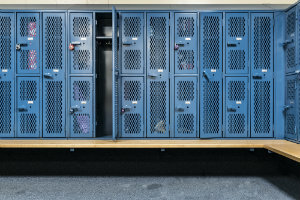 Love it or hate it, the locker room is an integral part of an athlete’s life—particularly if you play school sports or are part of a gym. It’s where you suit up, shower off, and generally transition to and from your athletic activities and the rest of your life. Unfortunately, it’s also a place where you can catch unpleasant and unsightly fungal infections on your feet or under your nails. If you’re struggling with itchy feet or discolored toenails, your locker room might be giving you fungus. The microscopic fungus that causes both athlete’s foot and fungal nail infections can be found all around nature. It absolutely thrives in warm, damp locations, particularly if they are enclosed. That’s why locker rooms are prime locations for the pathogen to fester and spread to you. A locker room is often warm and damp with athletes’ sweat and sweaty gear. Add showers to the mix and the humidity and wetness only increases. Unfortunately, this microorganism spreads quite easily, too. All it needs it direct contact: with your towels, with your bare feet, with your hands, anything. This doesn’t guarantee an infection, of course. The environment has to be right for it to grow. However, fungal infections like these aren’t something you can develop an immunity to. So if you’ve had the problem in the past, you can still get re-infected if you aren’t careful. If you’re dealing with itchy, burning feet, or you notice odd changes to your nails, you might just have a fungus problem from your locker room. The good news is that this is treatable, especially if you jump to take care of it right away. Topical medications can help destroy the pathogen on your skin and the surface of your nails. Other approaches, like oral medication and laser therapy, can address it underneath your nails as well. Our team at Podiatry Associates, P.C. will help you determine if your skin and nail issue really is fungus, or something else. The best approach, of course, is to protect your feet while you’re in the locker room to prevent a fungal infection in the first place. If you’re at all concerned about this, we can help! Contact us today online or by calling (303) 805-5156 to reach our offices in Cherry Creek, Castle Pines, or Parker, CO.